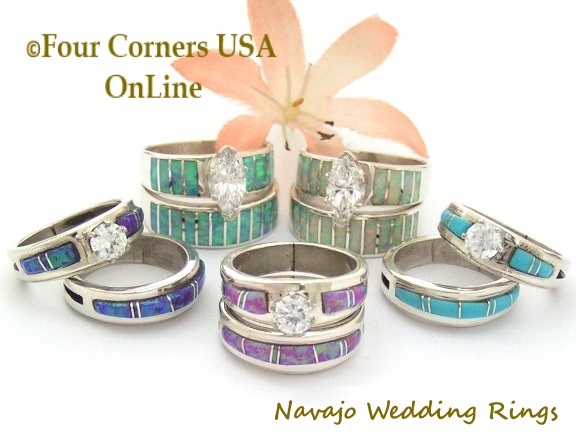 Native American Navajo Artisan made Engagement and Bridal Wedding Ring Sets for your Special Day. Gorgeous clear blue Turquoise Engagement Wedding Rings as well as White Fire Opal Inlay, Purple Fire Opal Inlay, Blue Fire Opals, Pink Fire Opal and various colors perfect for a nontraditional statement. We offer matching Bridegroom Inlay Wedding Ring Bands for most of our Bridal Sets. Our featured Jewelry Artisans include Navajo Silversmiths Ella Cowboy and Wilbert Muskett Jr.